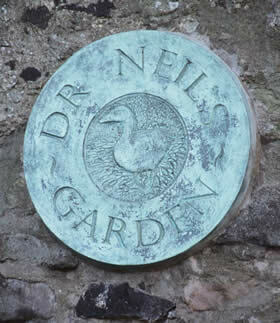 Dr Neil’s Garden is one of the most remarkable gardens in Scotland today. Lying next to the twelfth-century Duddingston Kirk, where the lower slopes of Arthur’s Seat meet Duddingston Loch, this secluded garden is the result of the imagination, dedication and sheer hard work of Drs. Andrew and Nancy Neil. It has sometimes been called Edinburgh’s Secret Garden. Many people find it more than a mere garden, and – both before and since the garden was created – this spot has to many been a place of inspiration (artistic, literary, and spiritual), and for meditation and contemplation. We hope that you too may also take away lasting memories, and spread the word about this special place to others. The planting is mostly conifers, heathers and alpines, with primulas (including the rare Pubescens), magnolias, rhododendrons, azaleas and many other shrubs. In one corner of the garden is the historic Thomson’s Tower, designed by William Henry Playfair, and built in 1825 for the Duddingston Curling Society to store its stones. Dr Neil’s Garden is so much more than a garden. It is a friendly place that welcomes all to its peace and beauty and at the same time offers comradeship and training to volunteers. The Garden stimulates change through play, learning, the arts, healthy activity, and by addressing the special needs of people. It is open to all, free of charge 7 days a week. There are many expenses and we rely on donations to keep our gardener and pay expenses. If you would like to help in the upkeep of this lovely garden you can do so by visiting our Donations page.